Post-COP21 a plethora of commentaries have called for an early ratification in 2016 to keep momentum as the world is heading into five decisive years for climate change. But very little has been published on states’ domestic efforts to follow up on the adoption of the Paris Agreement. This is due to at least three reasons: severe data paucity, a decrease in media coverage – and funding therefore – since January 2016, and the big players like the US and China taking up the limelight. This stocktaking report addresses these problems and provides a comprehensive overview of climate action since COP21 in India, Japan and South Korea. Intended as a follow-up to the European External Action Service’s (EEAS) Green Diplomacy Network, the report intends to lend a hand to European policymakers addressing climate change in the EU‘s three strategic partners in Asia. Looking at Table 1, there is good reason to not limit attention to the EU‘s number one Asian partner – China. 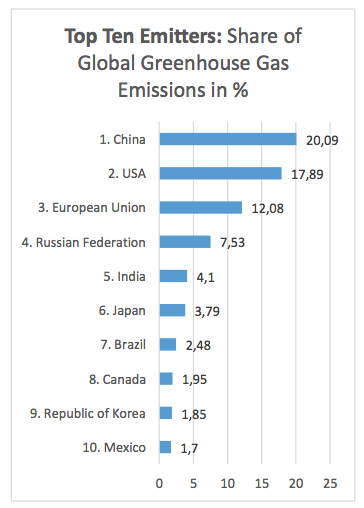 India, Japan and South Korea rank 5th, 6th and 9th in the list of top ten global Greenhouse Gas (GHG) emitters. They are also part of a select group of states, intending to expand their usage of coal significantly. As Carbon Capture and Storage (CCS) technology cannot be used on a largescale at low cost yet, coal represents the number one resource that needs to be retired if climate change mitigation is to have a chance at success. Therefore the usage of coal receives special attention in this report. Even if the Paris Agreement in its current form was implemented to 100%, a 2.7- 3.5 degree increase in earth surface temperature is likely, surpassing the important threshold of 2 degrees warming.2 In order to implement the Paris Agreement, 55 states, accounting for 55% of global GHG emission, need to ratify the agreement. As of the beginning of July, only 19 states, accounting for 0.2% of global GHG emissions, have ratified the agreement. Hence, creating momentum and analysing the obstacles to domestic climate action is a very timely exercise. While the projected coal usage remains alarmingly high, India is not picky about how to alleviate the energy poverty of 240 million Indians who do not have access to electricity. India has quickly become the fastest growing market for renewables, thanks to political support in the Prime Minister’s office. 9 As Andrew Steer from the World Resource Institute puts it: “Prime Minister Modi didn’t make this decision because he’s a member of Greenpeace. He did it because it makes the most sense for India’s economic development.”10 Modi had already increased the previous goal for photovoltaic capacity by factor five to 100GW by 2022. For comparison, in 2014 global installed solar capacity amounted to 181GW. 11 In July 2016 some members of government call for an even more ambitious goal as India doubled its solar power capacity to 7GW over 18 months.12 Ambitions are similarly high for wind power capacity, but prospects for hydropower look dim. Dams, dubbed the “temples of modern India” when they provided over 45% percent of energy in the 1960s, have come under fire for the environmental damage caused. 13 As an emerging economy and set to become the world’s most populous country, India needs to pay attention to the food-water-energy nexus in particular. In spring 2016 there have been alarming signals of Indian states not having paid their bills for renewable energy, amounting to as much as 360 million USD. 14 Access to attractive financing and an extensive upgrade and expansion of the electricity grid are key to deploy more renewables in India and it is increasingly clear why India’s INDCs are conditional upon receiving international financial support. Similarly, emission manipulation by Volkswagen and potentially also Nissan is a much debated topic in Korean newspapers. The ensuing debate about air quality led in June 2016 to the announcement that the government considers retiring old coal power plants. This would affect about ten of ROK’s 53 coal power plants.38 While plans for four new coal power plans were scrapped at COP21, ROK plans to build 20 new plants until 2021 nonetheless. Thus there could be a significant change for the Korean utility market ahead. At a presentation of a preliminary version of this paper, the question was raised what the use of global climate negotiations was if state’s climate action is in fact domestically driven. The above analysis has shown that India as a fervent defender of climate justice has been swayed into embracing technologies of the future on an impressive level thanks to international negotiations. The above analysis has also pointed out that India will indeed need international financial support to drop the technologies of the past as soon as possible. The case of Japan has also powerfully illustrated that no man is an island. Japanese investors start to realize that the relative prices of coal and renewable energy are determined on the global market, causing early movers to divest from the very coal industry its government embraces. In South Korea, studies commissioned abroad have highlighted the severity of Korean air pollution and pointed out that China cannot further be the scapegoat to blame as some pollution is home-made. International pressure and domestic resonance have lead South Korea to reassess its energy policy. In sum, international climate negotiations and media scrutiny have a tremendous potential to spur domestic climate action and to hold leaders accountable. For this process to accelerate, it is vital that countries’ individual climate action receives continuous attention and analysis. 1 Cf. Climate Action (2016): UN climate chief calls Paris agreement the “easy part” and calls for action at Davos. In Climate Action, 1/21/2016. Available online at http://www.climateactionprogramme.org/news/u n_climate_chief_calls_paris_agreement_the_easy_ part_and_calls_for_action_a, checked on 7/11/2016. 2 Cf. United Nations (2015): COP21 – Frequently Asked Questions. 2015 Time for Global Action for People and Planet. New York: United Nations, here: p. 3. Available online at http://www.un.org/sustainabledevelopment/wp- content/uploads/2015/10/COP21-FAQs.pdf, checked on 7/11/2016. 3 Cf. International Energy Agency; Organisation for Economic Co-operation and Development (2015): World Energy Outlook 2015. Executive Summary. Paris: International Energy Agency, Organisation for Economic Co-operation and Development, here: p. 2. Available online at http://www.iea.org/publications/freepublications/ publication/WEB_WorldEnergyOutlook2015Executi veSummaryEnglishFinal.pdf, checked on 7/11/2016. 4 Cf. 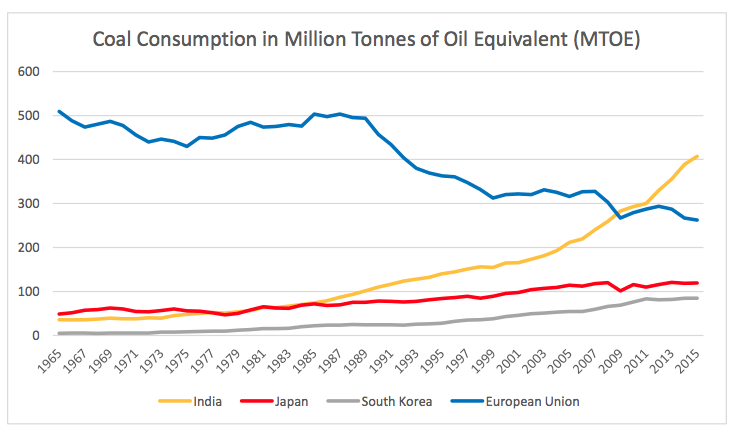 International Energy Agency; Organisation for Economic Co-operation and Development (2015): India Energy Outlook. World Energy Outlook Special Report. Paris: International Energy Agency; Organisation for Economic Co-operation and Development, here: p. 11. Available online at http://www.worldenergyoutlook.org/media/weow ebsite/2015/IndiaEnergyOutlook_WEO2015.pdf, checked on 7/11/2016. 5 Cf. Climate Action Tracker (2015): India, 12/2/2015. Available online at http://climateactiontracker.org/countries/india.ht ml, checked on 7/11/2016. 6 Cf. Climate Observer: India. Venice: International Center for Climate Governance. Available online at http://climateobserver.org/country-profiles/india/, checked on 7/11/2016. 7 Government of India, Press Information Bureau (2016): Operation of Coal Mines Auctioned/ Allotted in Schedule-II, 5/9/2016. Available online at http://pib.nic.in/newsite/pmreleases.aspx?mincod e=42, checked on 7/11/2016. 8 Cf. Shahan, Zachary (2016): India’s Renewable Energy & Coal Minister Talks Energy Transition (Clean Technica Exclusive). In Clean Technica, 7/1/2016. Available online at http://cleantechnica.com/2016/07/01/indias- renewable-energy-coal-minister-talks-energy- transition-cleantechnica-exclusive/, checked on 7/11/2016. http://articles.economictimes.indiatimes.com/201 6-07-02/news/74173057_1_renewable-energy- capacity-energy-option-solar-power-capacity, checked on 7/11/2016. 10 Cf. Press Trust of India (2016): India praised for its climate change initiatives. In The Economic Times India, 2/3/2016. Available online at http://articles.economictimes.indiatimes.com/201 6-02-03/news/70314109_1_climate-change- initiatives-solar-capacity-solar-energy, checked on 7/11/2016. 11 Cf. The Economist’s Data Team (2016): Indian Solar Power. In The Economist, 6/6/2016. Available online at http://www.economist.com/blogs/graphicdetail/2 016/06/daily-chart-2, checked on 7/11/2016. 12 Cf. Goswami, Urmi (2016): India’s renewable energy targets catch the attention of global investors, still need ground work. In The Economic Times India, 7/2/2016. Available online at http://articles.economictimes.indiatimes.com/201 6-07-02/news/74173054_1_india-s-energy- capacity-piyush-goyal, checked on 7/11/2016. http://economictimes.indiatimes.com/industry/en ergy/power/capacity-for-renewable-energy-in- india-hits-42850-mw-surpasses-capacity-of-hydel- projects/articleshow/52680042.cms?from=mdr, checked on 7/11/2016. 14 Cf. Upadhyay, Anindya (2016): India Utilities Seen Holding Up $360 Million for Renewables. In Bloomberg, 6/15/2016. Available online at http://www.bloomberg.com/news/articles/2016- 06-15/india-s-utilities-seen-holding-up-360-million- for-renewables, checked on 7/11/2016. 5 Cf. Vishnoi, Anubhuti (2016): India consider umbrella legislation on climate change Read more at: http://economictimes.indiatimes.com/articleshow /52931627.cms?utm_source=contentofinterest&ut m_medium=text&utm_campaign=cppst. In The Economic Times India, 6/27/2016. Available online at http://economictimes.indiatimes.com/news/politic s-and-nation/india-consider-umbrella-legislation- on-climate-change/articleshow/52931627.cms, checked on 7/11/2016. 16 Cf. Mourdoukoutas, Panos (2016): The Real Reason China Won’t Let India Join NSG. In Forbes, 6/30/2016. Available online at http://www.forbes.com/sites/panosmourdoukout as/2016/06/30/the-real-reason-china-wont-let- india-join-nsg/#2072dd21b2f6, checked on 7/11/2016. 17 Government of India, Ministry of External Affairs (2016): Spokesperson’s comments on NSG Plenary meeting in Seoul, 6/24/2016. Available online at http://mea.gov.in/press- releases.htm?dtl/26949/Spokespersons_comment s_on_NSG_Plenary_meeting_in_Seoul, checked on 7/11/2016. 18 Definition of “inadequate” as defined by Climat Action Tracker: „if all countries adopted this level of ambition, global warming would likely exceed 3-4oC in the 21st century.” Cf. Climate Observer: Japan. Venice: International Center for Climate Governance. Available online at http://climateobserver.org/country-profiles/japan/, checked on 7/11/2016. 19 Cf. Kyodo News (2016): Japan unlikely to ratify Paris climate accord by year-end: minister. In Kyodo News, 5/31/2016. Available online at http://kyodonews.net/news/2016/05/31/63267, checked on 7/11/2016. 20 Cf. Tsukimori, Osamu (2016): Japan’s CO2 emissions fall to three-year low in 2014/15 fiscal year. In Reuters, 4/14/2016. Available online at http://www.reuters.com/article/us-japan-carbon- idUSKCN0XC01S, checked on 7/11/2016. 21 Cf. Harding, Robin (2016): Japan’s nuclear restart stymied by courts. In The Financial Times, 4/6/2016. Available online at https://next.ft.com/content/1c92b5ac-fbbb-11e5- b3f6-11d5706b613b, checked on 7/11/2016. 22 Cf. Climate Observer: Japan. Venice: International Center for Climate Governance. Available online at http://climateobserver.org/country-profiles/japan/, checked on 7/11/2016. 23 Han, Chen; Doukas, Alex; Godinot, Sebastien; Schmidt, Jake; Vollmer, Sarah Lyn (2016): Swept under the Rug. How G7 Nations Conceal Public Financing for Coal Around the World. New York: National Resources Defense Council, here: p. 3. Available online at https://www.nrdc.org/sites/default/files/swept- under-rug-coal-financing-report.pdf, checked on 7/11/2016. 25 Caldecott, Ben; Dericks, Gerard; Tulloch, Daniel J.; Kruitwagen, Lucas; Kok, Irem: Stranded Assets and Thermal Coal in Japan. An analysis of environment- related risk exposure. Oxford: Smith School of Enterprise and the Environment, here: p. 6. Available online at http://www.smithschool.ox.ac.uk/research- programmes/stranded-assets/satc-japan.pdf, checked on 7/11/2016. 26 Littlecott, Chris (2016): G7 Coal Scorecard Update. Coal Phase Out Commitments and Power Plant Closures. London: E3G – Third Generation Environmentalism, here: p. 2. Available online at https://www.e3g.org/docs/G7_Scorecard_update_ May_2016.pdf, checked on 7/11/2016. 27 Cf. Lewis, Leo (2016): Japan warned of flaw in coal-fired power plants project. In The Financial Times, 5/11/2016. Available online at http://www.ft.com/cms/s/0/a7f90364-1770-11e6- b197-a4af20d5575e.html, checked on 7/11/2016. 28 Cf. Caldecott, Ben; Dericks, Gerard; Tulloch, Daniel J.; Kruitwagen, Lucas; Kok, Irem: Stranded Assets and Thermal Coal in Japan. An analysis of environment-related risk exposure. Oxford: Smith School of Enterprise and the Environment, here: p. 6. Available online at http://www.smithschool.ox.ac.uk/research-programmes/stranded-assets/satc-japan.pdf, checked on 7/11/2016. 29 Cf. Obayashi, Yuka (2016): Mitsui to trim thermal coal assets amid climate concerns: CEO. In Reuters, 5/11/2016. Available online at http://www.reuters.com/article/us-mitsui-results- ceo-idUSKCN0Y20PW, checked on 7/11/2016. 30 Cf. Hill, Joshua S. (2016): China, US, & Japan Lead Solar PV, As EU Slows. In Clean Technica, 3/1/2016. Available online at http://cleantechnica.com/2016/03/01/china-us- japan-lead-solar-pv-eu-slows/, checked on 7/11/2016. 31 Hill, Joshua S. (2016): Japan Solar Installations To Peak In 2016 At 13.2–14.3 GW, BNEF Projects. In Clean Technica, 2/22/2016. Available online at http://cleantechnica.com/2016/02/22/japan-solar- installations-peak-2016-14-3-gw-bnef/, checked on 7/11/2016. 32 Cf. Climate Action Tracker (2015): South Korea, 7/2/2015. Available online at http://climateactiontracker.org/countries/southko rea.html, checked on 7/11/2016. 33 Choi, Hyeonjung; Lee, Soohyun (2015): Not Good Enough. 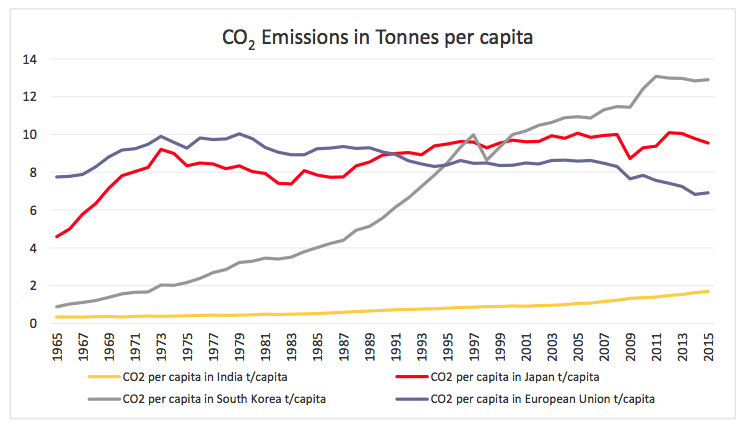 South Korea’s 2030 Carbon Mitigation Target and the INDC. Seoul: The Asan Institute for Policy Studies, 10/29/2015. Available online at http://en.asaninst.org/wp- content/themes/twentythirteen/action/dl.php?id= 34994, checked on 7/11/2016. 34 Cf. Climate Observer: South Korea. Venice: International Center for Climate Governance. Available online at http://climateobserver.org/country-profiles/south- korea-2/, checked on 7/11/2016. 35 Cf. Hsu, Angel: 2016 Environmental Performace Index. New Haven: Yale University, here: p. 12. Available online at http://epi.yale.edu/sites/default/files/2016EPI_Full _Report.pdf, checked on 7/11/2016. 36 Cf. Shuan, Sim (2015): Smog In Korea. Coal Power Plants, Not China, Are Major Culprits, Says Greenpeace. In International Business Times, 3/4/2015. Available online at http://www.ibtimes.com/smog-korea-coal-power- plants-not-china-are-major-culprits-says- greenpeace-1835638, checked on 7/11/2016. 37 Bae, Hyun-jung (2016): Korea runs pell-mell over fine dust measures. In The Korea Herald, 6/1/2016. Available online at http://www.koreaherald.com/view.php?ud=20160 601000998, checked on 7/11/2016. 38 Cf. Lee, Charles; Kannan, Deepak (2016): S Korea to shut aging coal-fired power plants, LNG to get a boost: minister. New York: S&P Global Platts, 6/8/2016. Available online at http://www.platts.com/latest-news/coal/seoul/s-korea-to-shut-aging-coal-fired-power-plants- 27603471, checked on 7/11/2016. 40 Cf. Hongo, Takashi (2016): South Korea’s emissions trading scheme bears watching. In Nikkei Asian Review, 6/9/2016. Available online at http://asia.nikkei.com/magazine/20160609-TAKE- TWO/Tech-Science/Takashi-Hongo-South-Korea-s- emissions-trading-scheme-bears-watching?page=1, checked on 7/11/2016. 41 Cf. Yonhap News Agency (2015): Government policy coordination organization to lead climate change policies. In The Korea Herald, 5/17/2015. Available online at http://www.koreaherald.com/view.php?ud=20160 517000631, checked on 7/11/2016.